← Tim Thomas Considering Sitting Next Season? 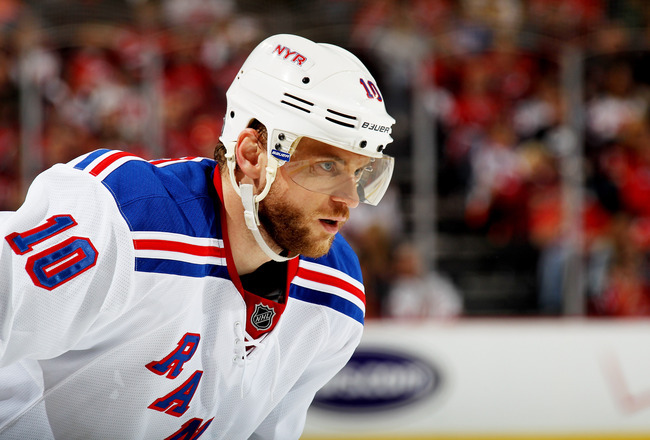 The New York Rangers’ Marian Gaborik needs rotator cuff surgery on his shoulder and will be out 4-6 months. This doesn’t affect the Rangers this season as they got eliminated in the Eastern Conference Finals, but it will affect them next season. Gaborik is expected to miss up to the first half of next season and will be back between November and January. Surgery is scheduled for June 6th. Gaborik sustained the shoulder injury early in April and had been playing for almost two months despite the pain. Gaborik really aggravated it in Game 3 or 4 of the first round series against the Ottawa Senators when he got hit into the boards hard. A lot of the blame for the Rangers losing to the Devils was put on Gaborik as he hadn’t performed up to his level. He recorded only five goals and eleven points in twenty playoff games. Everyone knew there must be a reason for Gaborik’s absence in the playoffs and it is a very valid one. If the injury occurred early in the season, he most likely would’ve taken time off to heal but since it is the Stanley Cup playoffs, he toughed it out. Hopefully Gaborik will be able to fully recover from his injury and return to help the Rangers make another Stanley Cup run next season. This entry was posted in News, Trades, & Signings and tagged Marian Gaborik, New York Rangers, NHL, Ottawa Senators, Stanley Cup Playoffs. Bookmark the permalink.